Monarch Air Group provides private air charter in Oceanside, CA. Our clients benefit from top-notch service, unrelenting dedication to safety, wide selection of aircraft, and years of experience in chartering private jets. To obtain a free quote, please use our online quoting tool provided below, or call toll free 1-877-281-3051. Monarch Air Group provides private jet charter flights in and out of Oceanside, California, USA. Oceanside is a residential and commercial city in southwestern California, north of San Diego. It is also the 3rd-largest city in San Diego County. The population of the city is approximately 183,095 people and the total area is 42.2 square miles. 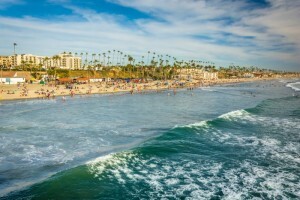 The most popular tourist attractions include California Surf Museum, Arcadian Ascents, The Pier at Oceanside, Oceanside Farmer’s Market, Oceanside Sunset Market, Guajome County Park, San Onofre State Beach, Buena Vista Audubon Society & Nature Center, and much more. The nearest airports are McClellan-Palomar Airport (CLD / KCRQ), which is located 10 miles from the city, San Diego International Airport (SAN / KSAN), which is located 38 miles from Oceanside, and John Wayne Airport (SNA / KSNA), which is situated 50 miles from Oceanside. 4. BXS, Borrego Springs, Borrego Springs, United States. 6. CIB, Ap In The Sky, Catalina Island, United States. 7. CJN, Gillespie Field, San Diego/El Cajon, CA, United States. 11. FUL, Municipal, Fullerton, United States. 12. HMT, Ryan Field, Hemet, United States. 13. JDY, Heliport, Downey, United States. 14. JID, City Of Industry H/P, Los Angeles, United States. 15. JNP, Heliport, Newport Beach, United States. 16. JOR, The City Heliport, Orange, United States. 17. JRD, Heliport, Riverside, United States. 18. LGB, Long Beach Municipal, Long Beach, United States. 19. MYF, Montgomery Field, San Diego, United States. 20. NKX, Miramar MCAS, San Diego, United States. 1. Carlsbad Inn Beach Resort, 3075 Carlsbad Boulevard, Carlsbad. 2. Tamarack Beach Resort, 3200 Carlsbad Boulevard, Carlsbad. 3. Motel 6, 909 North Coast Highway, Oceanside. 4. Carlsbad Inn Beach Resort, 3075 Carlsbad Boulevard, Carlsbad. 5. Dolphin Hotel, 133 South Coast Highway, Oceanside. 6. Tamarack Beach Resort, 3200 Carlsbad Boulevard, Carlsbad. 7. Motel 6, 909 North Coast Highway, Oceanside. 8. Oceanside Pet Hotel, 2909 San Luis Rey Road, Oceanside. 9. Carlsbad Inn Beach Resort, 3075 Carlsbad Boulevard, Carlsbad. 10. Carlsbad Inn Beach Resort, 3075 Carlsbad Boulevard, Carlsbad.